Are Garage Flooring Options Making Your Head Spin? Comments Off on Are Garage Flooring Options Making Your Head Spin? So you decided you wanted to redo your garage floor. You thought it was going to be simple and then you realized there are so many options that it is making your head spin. Each and every time you narrow down the options, you get more and more confused. Does this sound familiar? We are a Garage Flooring company, staffed by industry experts and we are here to help. You can call us at 800-956-4301 or email us at sales@garageflooringllc.com . In the meantime let’s have a look at some of the options. Why do I need Garage Flooring At All? 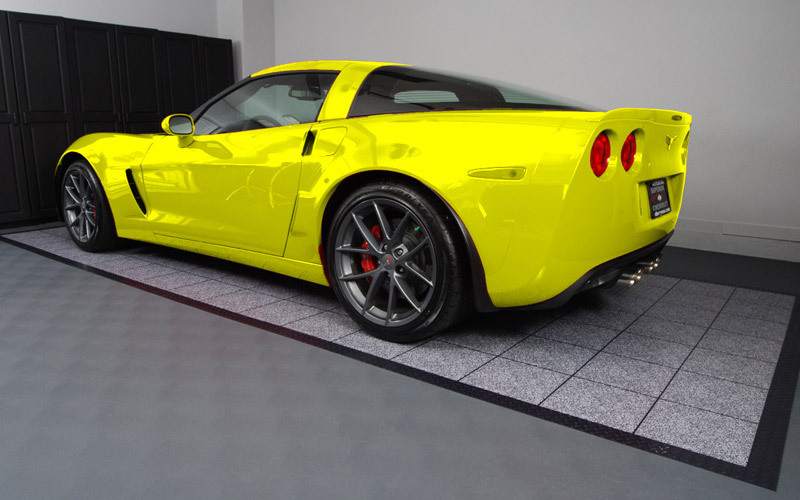 Different customers have different reasons for purchasing garage flooring. Many customers are looking to protect their concrete while others simply want a more attractive garage. Your reason for deciding to move forward with this project plays a major role in what product is best to cover or coat your concrete. Are you willing to do the work or pay someone else to do it. Regardless of claims to the contrary, garage floor epoxy requires extensive surface preparation. Oil and other stains must be removed and grinding or at minimum acid etching is necessary. It is a lot of work and needs to be done. You must be willing to either do it or pay big bucks to have someone else do it. Are you willing to leave your stuff out of your garage for 3 days and not park on your floor for 7 days. These times vary slightly, but they are pretty well accepted. Are you willing to purchase the right material. A pretty box at a home center is likely to be 70% or more water or low quality product. 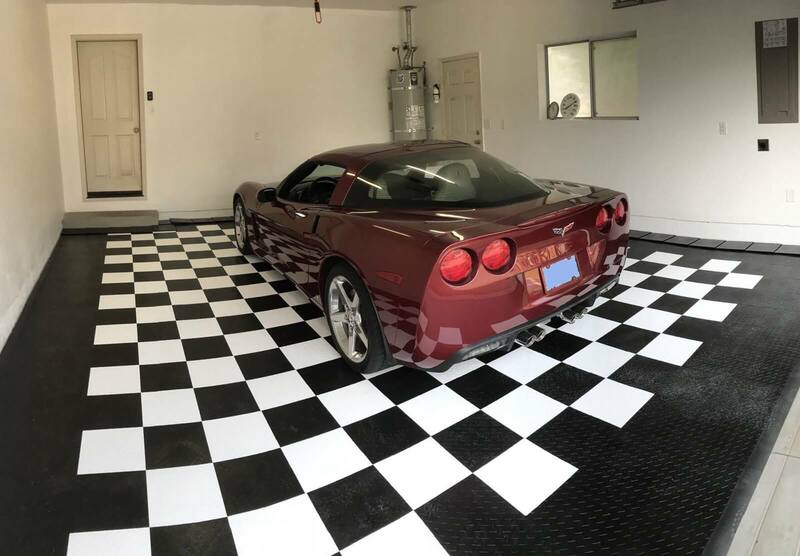 You do not have to buy our garage floor epoxy, but make the purchase from someone who is experienced in the industry and can walk you through the project. Also if they are not recommending a 100% solids epoxy base coat and a top coat then they are not the right supplier. 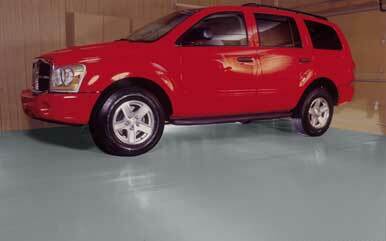 UPDATE: We have finally launched a quality garage floor coatings for under .90 / Sq. Ft that requires NO acid etching and NO grinding. It will not lift from hot tires, flake, peel or yellow. Rust Bullet breaks the stereotypes, even those we discuss, when it comes to garage floor coatings! Mats or roll out garage flooring is by far the easiest and often the least expensive product to cover your garage floor and protect your cement. Garage floor mats can be installed under your vehicles or over the entire garage floor. 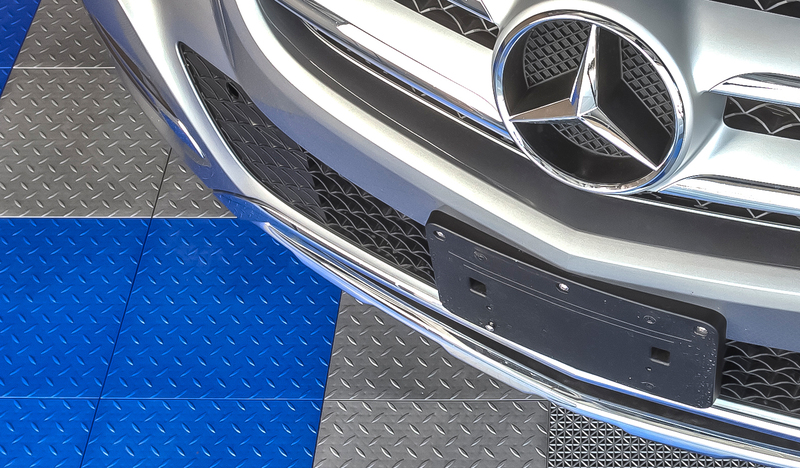 If you are going to do a wall to wall installation we highly recommend the G-Floor Small Coin Garage Floor Mats for most garages or the Ribbed Garage Floor Mat if you are concerned about channeling moisture and debris. The original coin pattern works great as well. The diamond pattern product is also extremely attractive, it is just no great for rolling toolboxes, creepers or jacks. 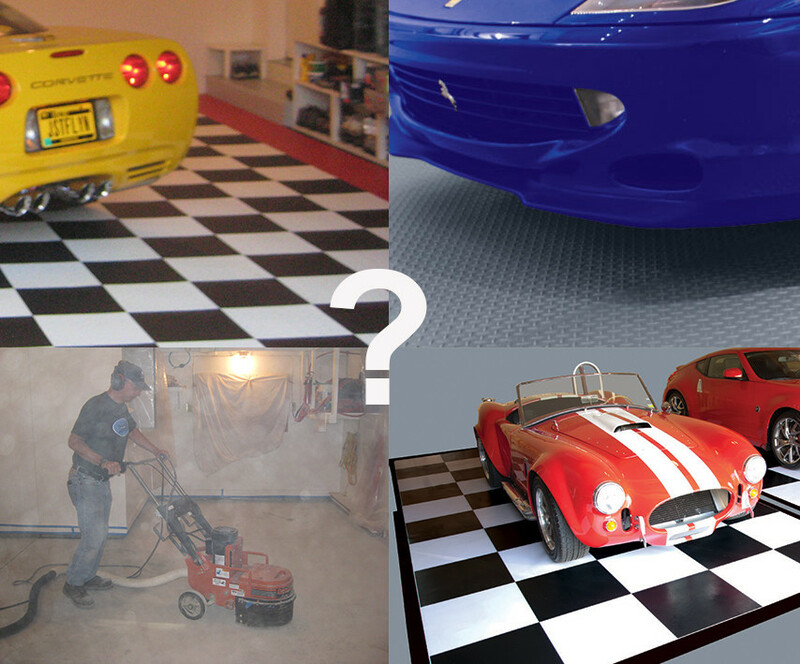 If the purpose of the floor mat is simply to beautify your garage than the pattern becomes a question of preference. Color is also an important factor. We highly recommend gray or black. Black hides tire marks best, but dirt, etc shows more. Gray hides more of the dirt but in some cases does show tire marks. The other colors are all generally very susceptible to tire marks. If you are looking for a floor that stays clean and is less likely to stay we would recommend either maintaining it with Hilway Direct Plus or coating it with the manufacturers stain blocker. Mats are generally not glued to the floor but for wall to wall applications the seam tape is highly recommended. The mats should be cut 1/4″ short of the garage door and generally do not lift on the edge. In some cases, if there is lift, 3M #80 Spray adhesive is a great way to seal JUST THE EDGE of the floor. Garage floor mats provide a virtually instant surface that can be parked on right away. They are inexpensive, install very quickly and look great. They are also ridiculously easy to install. The big things to watch with mats are expansion and contraction, tire marks and movement all of which are manageable with the proper installation and care. With all the choices, the G-Floor small coin product is what Justin put in his own garage! The biggest downside to mats, in our opinion is getting them off the truck. 10′ Rolls and larger 9′ rolls ship on a large freight truck and require you to be home and unload. It is also important to note that if you are just looking to keep mud, snow, ice and water off your floor we have a variety of containment mats available. Containment mats are not decorative. They use a mat and edging to keep fluids and debris in place. Garage floor tiles provide a host of patterns, colors and limitless combinations. We have had customers deign everything from flags to checkerboard into their floor. While some customers have used VCT, ceramic or porcelain, for our purposes there are two basic types of garage floor tile. PVC : PVC is generally referred to as rubber garage tiles, which as the name would imply is inaccurate. Rubber is not suitable for vehicular traffic. PVC is quiet, flexible and provides a seamless appearance when doing a single color. It does a better job of protecting the floor than hard plastic tiles but is generally not 100% watertight — but more than enough for most of our customers. If you are installing over a wood sub floor or if your garage sits on top of a basement you should consider Tuff Seal. Otherwise we highly recommend TrueLock PVC garage floor tiles . The downside to PVC tiles is they can stain if not maintained or coated and the locks show when you are doing multiple colors — it kind of looks like puzzle pieces. Polypropylene tiles are basically a hard plastic tile. They range in price from $2.29 (on sale) for the TrueLock Diamond tile on up to almost $4 per square foot for our best garage tile the TrueLock Plus Ribbed. Pattern is generally a matter of preference. The TrueLock Plus Ribbed stay remarkably clean (especially in pearl gray) and the surface is always dry and slip resistant. Polypropylene tiles are more stain resistant than PVC and many would argue look much better where multiple colors are combined. They can be a little noisy if you do not use a landscape fabric underneath. They also do not offer any protection to the concrete below –which you are never going to see. So which tile would I buy? If I had a working garage I would go with the TrueLock PVC in smooth. If I was looking for a garage to show off my car I would go with the TrueLock Plus Ribbed (best choice overall) or MotorMat diamond if looks were my primary concern. If price was my main concern and this was just a place to park my car, I would have to take a serious look at the TrueLock diamond because of the amazing price point on an American Made garage tile. Now you have the basic information you need to make an educated decision. A couple of parting thoughts. Stay away from products that are not made in the US. Be very leery of purchasing the products through home centers and club stores. First, often their prices only appear lower. Second they do not have the knowledge to walk you through the process and third often their garage floor mats have stayed rolled for a long time and will take a much longer period of time to relax — if they ever do. We all know price is important. We all have a budget to work within. As you are evaluating your options, it is important to consider that when you are spending from $750 to $5000 dollars a $200-400 price difference for different products should not be the main factor in making a decision. If you are going to do the project, don’t settle for your second choice over a relatively small investment difference. Lastly, garage flooring is what we do and we are here to help. If you have questions we have live chat, our toll-free number 800-956-4301 and email (sales@garageflooringllc.com) support. All of our options are staffed by people in the garage flooring industry and never a call center or answering service.